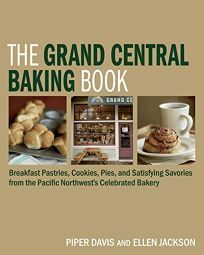 Davis, daughter of the woman who founded the renowned Pacific Northwest bakery Grand Central, shares secrets for 85 breakfast pastries, scones, cookies, pies and other baked goods in this reliable resource. Would-be pastry chefs looking for culinary showmanship will likely be disappointed by Davis&apos;s rustic recipes, but those with an appreciation for solid, buttery fare will be swooning over the results from recipes like individual bread puddings, Belgian waffles, Lemon Cream Sandwich Cookies and a rich Raspberry Port Trifle. Unfortunately, those results are always thoroughly described in Davis&apos;s instructions-not a problem for the bulk of recipes (tarts, cakes, sticky buns) but problematic for more unusual entries like Dutch Babies or biscuit-like Jammers. Still, Davis makes up for these occasional lapses with useful pro tips like how to freeze pies, pie dough and cake batter to maximize efficiency come production time. She also provides proper techniques for a range of skills, from dough handling to building and decorating the perfect layered birthday cake. Readers passionate about their baked goods are sure to find a wealth of favorites.